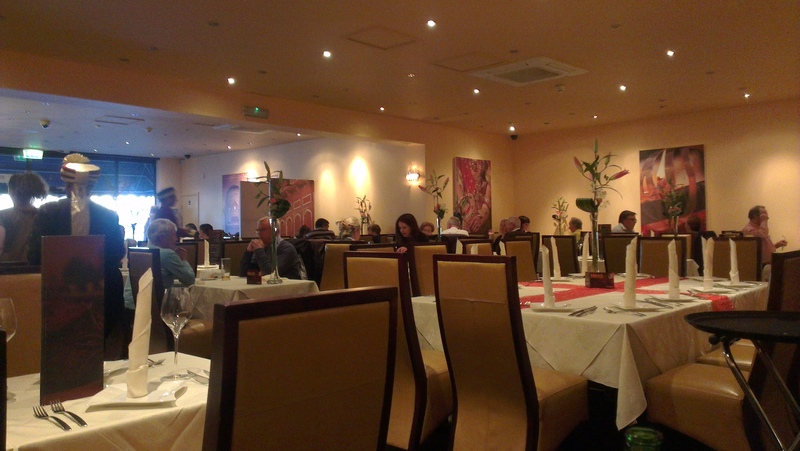 I don’t eat out of the city centre as much as I would like, however a combination of Haveli’s position as one of the top rated Indian’s in Nottingham on tripadvisor, and a friend buying a house nearby, meant a visit to this restaurant was all but inevitable. The restaurant describes itself as Indian fine dining. This is reflected in the interior with crisp linens and large flower displays adorning tables. Hospitality is also a big part; customers are greeted at the door with a handshake, presumably (hopefully!) from the owner. To the food. Popadoms and dips were very much traditional and pleasant but nothing further to note. The menu features classics and favourites along with some Haveli specials, but never straying far from familiarity. My starter was the best dish of the evening, Prawn Puri. 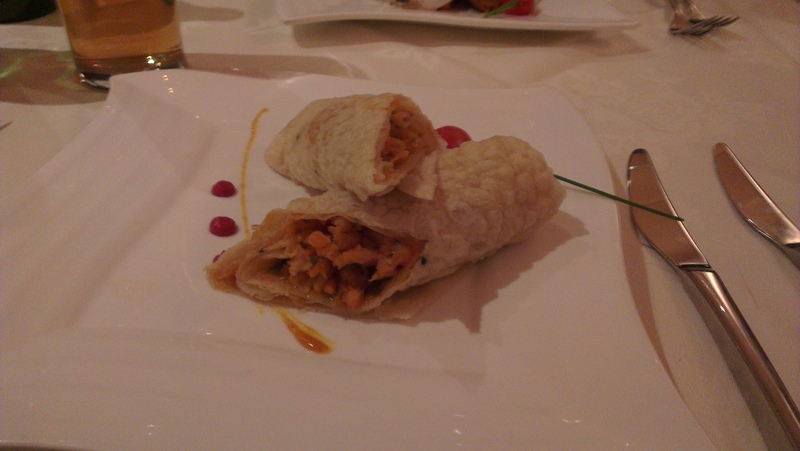 Puri is an unleavened bread, this particularly fine example was very light with a well spiced filling and good prawns. A Haveli khazana is a mixed grill of sorts. Lamb tikka the highlight against chicken tikka and a seekh kebab, the meat were well cooked in the tandoor but the spicing didn’t stand out. A main course of Haveli Chicken described itself ‘a firm favourite…no further recommendation required’, a bold statement in any restaurant. I’m not quite sure the dish lived up to the claim, although the chicken was good and a nice warmth from the tomato based sauce. A dish with a similar base, lamb desi had even better, tender meat. The only disappointment was a lamb saag, the lamb suffering from being overcooked. Breads were good, a peshawri naan of mine just the right level of sweetness. Service was mostly very attentive, but slightly strange. They seemed to not have a dedicated waiter for each table/area which led to us having 5+ different people server us throughout the evening. This may be why they missed an order of water for the table. 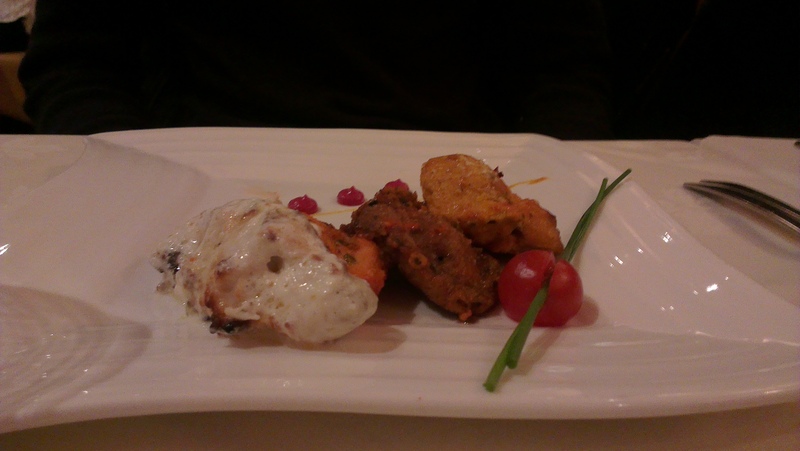 Overall it was an enjoyable experience, if Haveli was my neighbourhood Indian restaurant I would be very pleased. The cost too came as a little surprise, a chicken Jalfrezi and pilau rice at Haveli being £2.70 more expensive than Memsaab in the city. It doesn’t offer enough to tempt me away from award winning Memsaab and excellent 4550 on Maid Marian Way. relativity figures in all things – bet you did not pay £1.25 for EACH popadom at Haveli as you would have had to at Memsaab’s. popadoms are complimentary at Haveli even when i asked for second helpings including for my takeaways. Haveli is a little gem that does not attract the usual clientele a city centre establishment does at that time of the evening – no loud revellers, heavy drinkers … and parking is free!